I am very grateful for the checks I am receiving to help in feeding my baby. Considering my baby has certain allergies to milk, the W.I.C center at Elmhurst provides me with alternates so that my baby can still be nourished. I also breastfeed my baby. Overall, I appreciate the resources W.I.C provides because they are beneficial; and I am very grateful. The W.I.C office at Elmhurst is helpful. I could share my feelings with them. They give Enfamil after 6 months and is helpful for the baby because at that time the baby is growing and needs it. My baby started solid foods and W.I.C gives cereals, fruits, fruit paste, etc. This is helpful for me as a mom especially when I have no time on hand this food can be given easily. The W.I.C program understands the things we need for ourselves and the baby- this is the most important thing. For me, they help with breastfeeding as well as observe myself and the baby’s health to see if we are okay. This is helpful. I breastfed my children until they were 2 years of age. I have been apart of a group support that have provided me a lot of information and techniques that helped me on this beautiful journey. I have learnt all the benefits that breast milk has for my baby and for myself. Giving my babies the best nutrition is my greatest accomplishment. I am so glad I did not give up. I got to know about the WIC program from my cousin. I came to receive WIC services for the first time during my last trimester. I feel like WIC has helped me in many different ways- like that of giving nutrition education that has helped me to offer my child more healthy foods to eat. The checks were also very helpful for buying different foods. As for the staff, they were always cooperative and helpful. It was of great help being apart of this program and being able to receive the services it provides. No more paper checks! Just take your eWIC card and WIC shopping list to the store to only buy the foods you need at that time. Open to mothers looking to connect with other mothers. Feel free to join us every Tuesday from 3-5 pm for breastfeeding support. eWIC is coming to Elmhurst! Due to these changes the Elmhurst WIC office will be closed the week of March 24th-March 29th, as we will be training and doing database updates. We apologize for this inconvenience. We look forward to serving you in April and introducing you to our new electronic EBT card system. We encourage our participants to also download the “WIC2GO” app. This can be downloaded on any smart phone device at the google play or app store. We hope this new system will be easy and convenient for our participants. On average a baby should be taking about 2.5 ounces of formula per ever pound of body weight (453g). Most babies are satisfied with 3 to 4 ounces per feeding during the first month and increase that by 1 ounce per month until they reach the max 7 to 8 ounces. Am I feeding my baby enough? When using powdered infant formula: make sure the water you are using is from a safe source: Examples- Nursery water, filtered or bottled water, boiled water. Use the amount of water listed on the formula instructions. Too much water can decrease amount of nutrients and nutrition the baby is receiving, too little water can cause digestive issues, kidney issues and dehydration. Always measure the water first, then add the powder. Prepared infant formula can spoil if left out in room temperature. 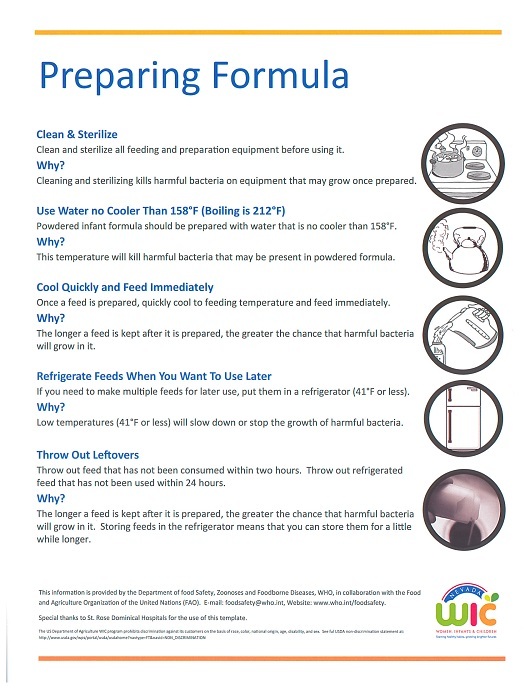 Use prepared room temperature formula within 2 hours. If you choose to save formula, refrigerate before the 2 hour mark. Discard any left over formula, in the bottle, after feeding the baby. The mixture of babies saliva and formula can cause bacteria to form.